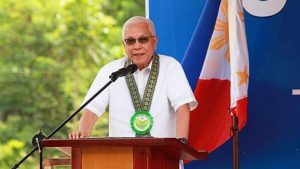 Cabinet Secretary Leoncio Evasco, Jr. met with town mayors yesterday while assuring to exert efforts to deliver their much needed infrastructure projects in their respective localities. Evasco told the town executives to channel their requests to Rep. Aris Aumentado who convened the mayors to a meeting with the Cabinet secretary at Dao Diamond Hotel yesterday. Out of the 47 mayors, 37 attended the first exclusive meeting with Evasco since he assumed the Cabinet secretary post. Tagbilaran City Mayor Baba Yap joined the municipal mayors during yesterday’s meeting. Evasco, a former town mayor of Maribojoc, briefed the town executives on how they can avail of funds from the national government. “I will exert efforts to bring your requests to the national government agencies concerned,” assured Evasco. He prioritized projects on roads, multi-purpose buildings, irrigation or small water impounding projects. Evasco, who is rumored to be joining the gubernatorial race in the 2019 polls, explained that his meeting with the town mayors is part of his duty of bringing the government closer to the people. He is presently assigned by Pres. Duterte to head 12 clusters of government agencies tasked of alleviating the living condition of the poor. During an earlier interview with the Chronicle, the Cabinet secretary clarified that his running for governor can only be possible if the President himself will tell him to do so.